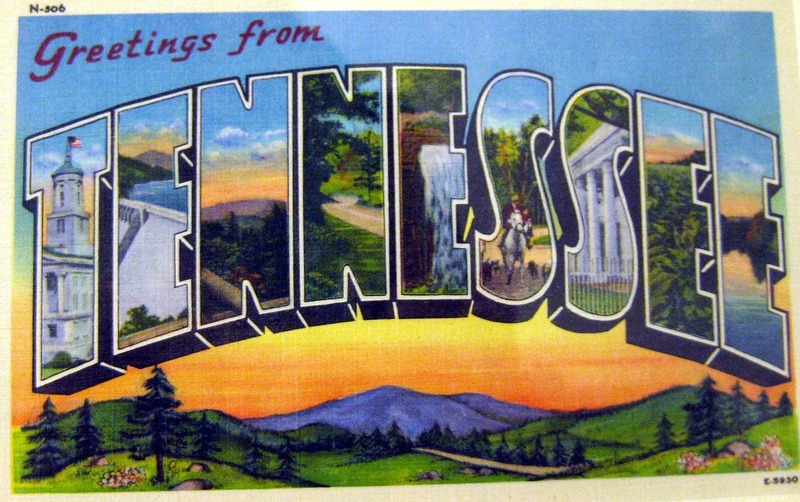 The Tennessee calendar painting that took me for-evah. Do you think anyone would notice if I just whited out the 2 in 2012 and made it into a 3 come January? Never mind the incorrect dates, no ones pays attention to that sort of thing...right? 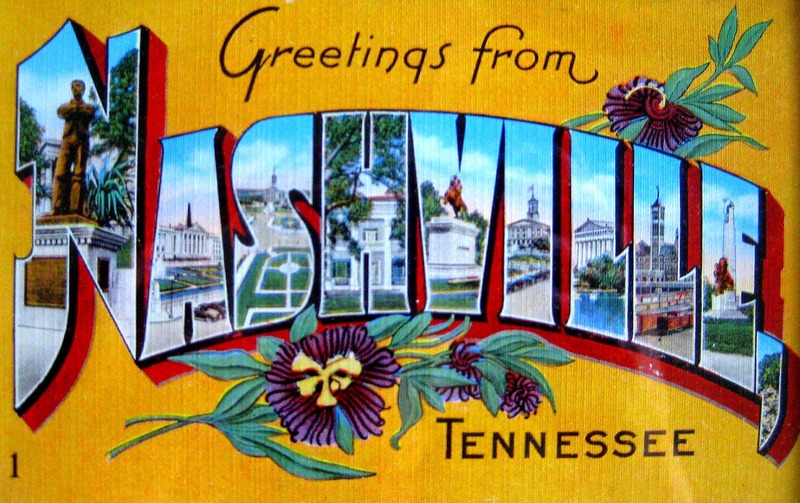 Hello Tennessee- and those-that-live-in-other-fabulous-places friends! I'm taking a little break from the thought of cleaning (because the thought alone wears me out, I can never get to the actual doing) and dreaming up my next DIY. I've been itching to create another painting, not having created one since my World War II-inspired love letters and the Soda Jerk painting. This time I'd like to create another Tennessee themed piece. Vintage postcard found in a local antique shop. decided to hunt for vintage Tennessee souvenirs and see what I could create with them. The little triangle flags (I know those have a name...what are they called?!) have been up since a party we had...and I liked the too much to take down. I started with this chalkboard piece last summer. I thrifted this frame, complete with tagboard backing. 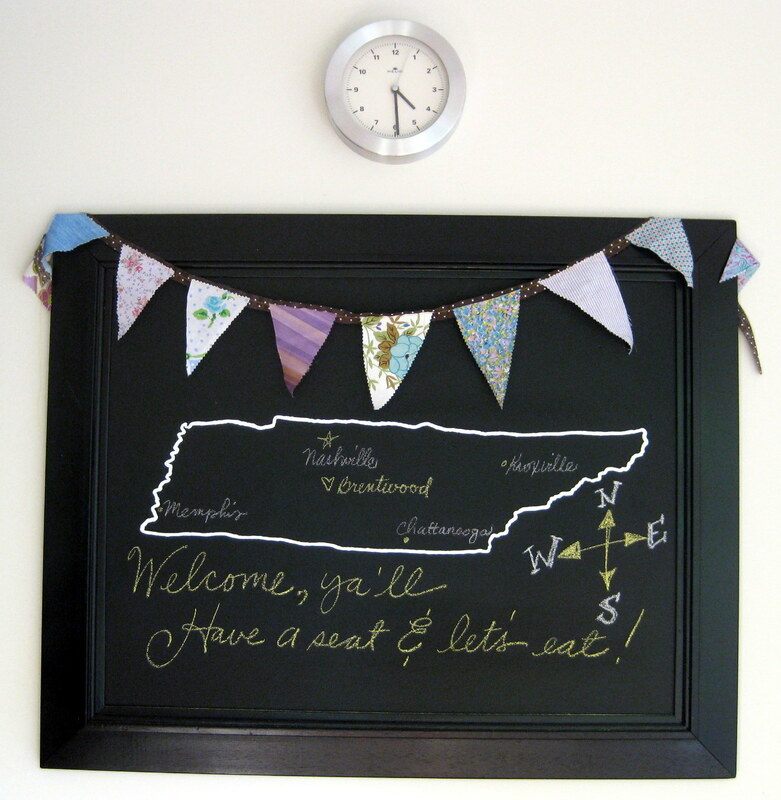 I spray painted the frame with a satin black and painted chalkboard paint onto the surface of the tagboard. 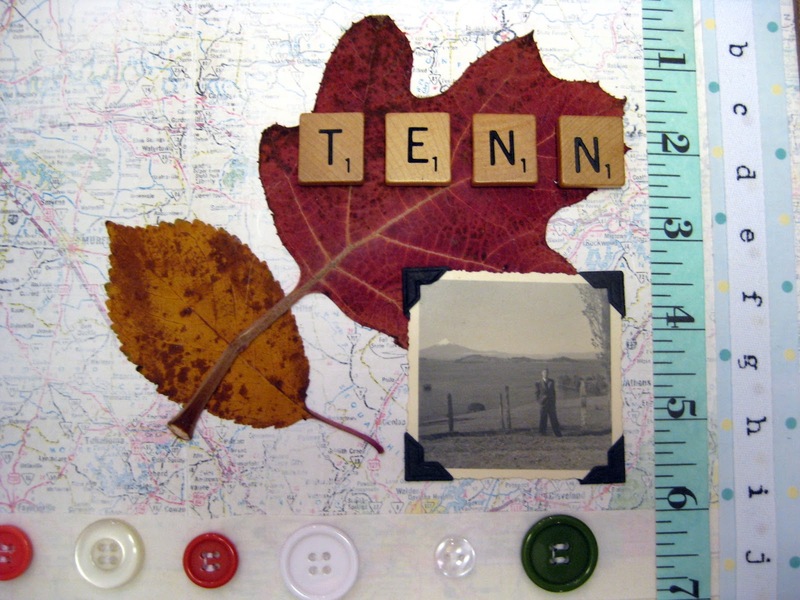 Once that was dry, I used acrylic paint to create the image of Tennessee. Super simple DIY! 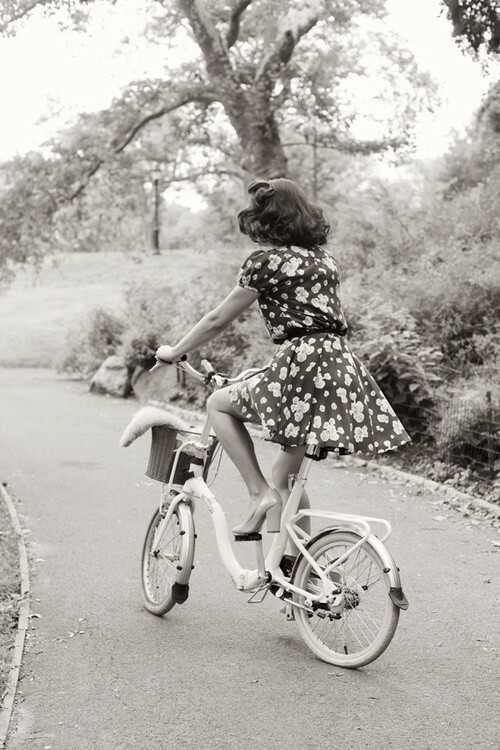 Vintage photos have got to be my absolute favorite. Never mind that I don't know the people! I just love seeing a snapshot into the lives of the past. 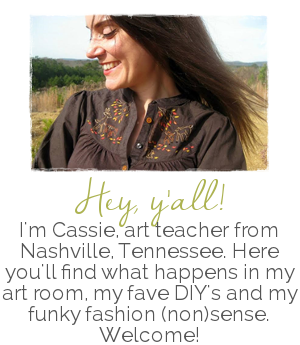 I was super bummed about the high cost of the Tennessee photos. So I started scouring ebay and etsy for such. 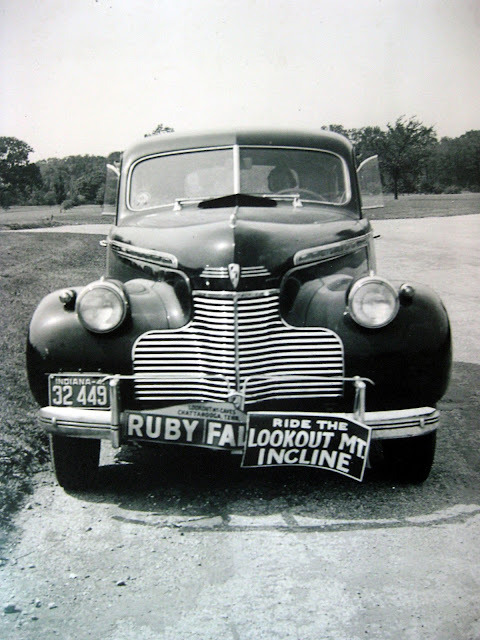 I lucked out when I won an ebay auction that granted me a family photo album full of a 1940's trip to the Smokey Mountains. I took the photos to our local photography shop and had them enlarged. They are now framed and hung around the house. Not too long ago, we took a trip to Chattanooga, Tennessee which is most famous for it's Incline Railroad to Lookout Mountain. 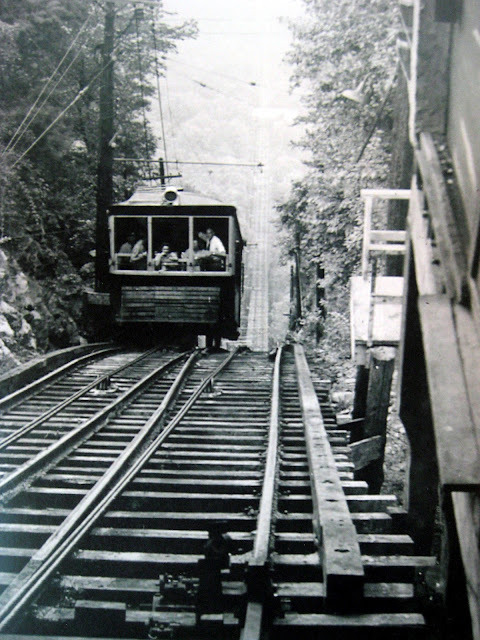 The railroad has actually been left unchanged since the above photo. You can read more about our little trip here. Other framed vintage Tennessee goodness around the house is an old map and an original large photo of a group of tourists at Lover's Leap. Sorry, they were too difficult to photo what with the reflective glass and all. You get the idea. In the Smokies, one is bound to see a bear. On one of our trips, we witnessed a crazy woman outside of our hotel trying to get an up close and personal photo of a bear. Thankfully the bear was too distracted by the Taco Bell meal he'd manage to uproot from the trashcan to notice her. Not wanting to witness a crazy-lady-bear-attack, hubs informed the lady, "You know they eat people, right?" Most of my frames are either thrifted or Target'ed. The above came from Target, complete with the matte. When I find a thrift store frame, I almost always spray paint it black to add some consistency to the look. On two occasions, I've taken my thrifted frames to Joann's for the matting and the glass. Thrifted frame, tourist map, bits and bobs from the craft room. This map was modge-podged right over the original image. I then slathered it with some thinned white paint to set it back a little bit. I have a leaf press and went through this crazy faze where I leaf pressed any fall leaf I could find. Everything was hot glued into place and it now hangs in something called The Butler Pantry...aka, the-place-where-hubs-throws-his-stuff. Just a little close up. 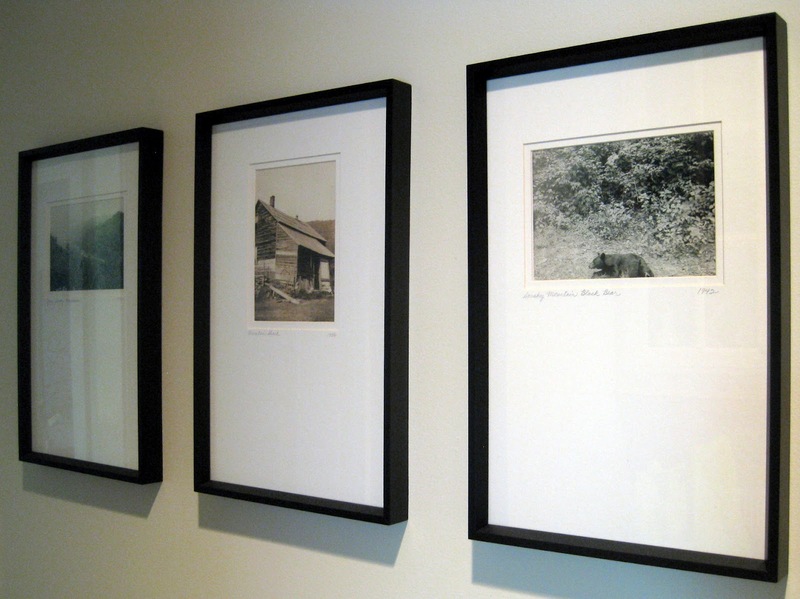 The photos were also in the Smokey Mountain photo album. When hubs goes for his walks in the woods, he always comes home with the most beautiful feathers. I loved this delicate one. Thrifted candle stick holders, spray painted black, thrifted orange polka dotted bowl, painting by me, TN letters from Joann's spray painted silver. And here's my latest inspiration! Also picked up at an antique shop. I have a huge 5' X 2' canvas that I plan to paint this image onto. I cannot wait to start on it and I'll be sure to share it with you once complete! After days of eating Sweet CeeCee's frozen yogurt (once even for dinner! ), scoping out countless estate sales, spending time with friends and family, shopping at farmer's markets and seeing my nephew graduate from high school (what?! ), I'd say summer has arrived. And to think I'm only five days in! I am so looking forward to more days like this. This week I found some vintage ads, patterns and photos that I thought went along with what I wore. But now I need your help...with summer being here, do you really wanna see what I wore everyday? I'm wondering if I should temporarily put this post series on hold until school resumes...or not. I'd love to hear your thoughts. I do hope you are having a fantastic Memorial Day weekend! Thanks for dropping by. 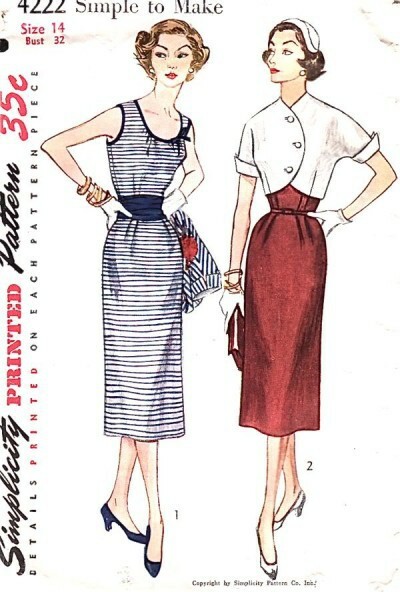 OH, can I please have the sailor dress on the left? Love the big red bow. 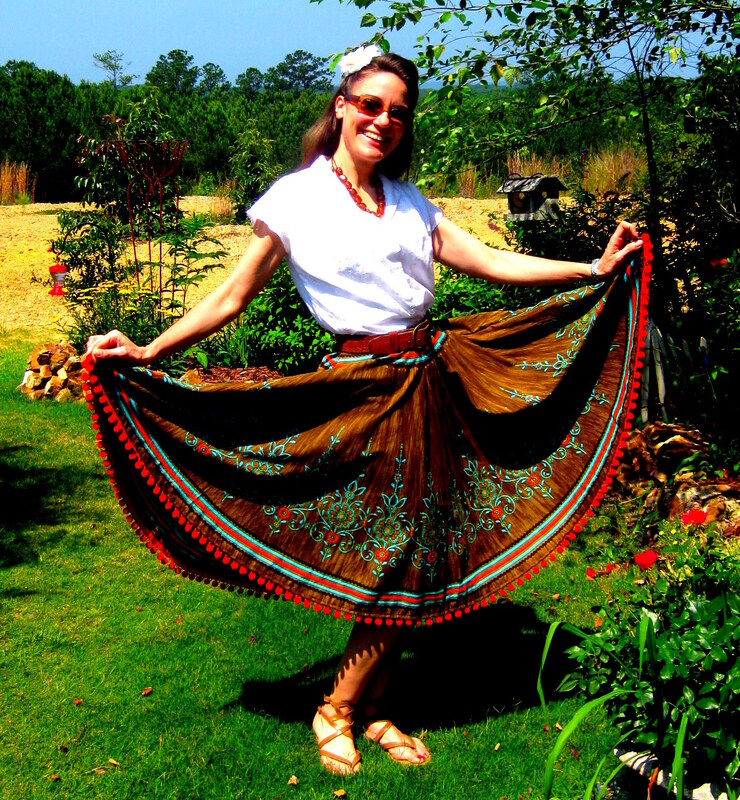 Check out this blog for more vintage goodness. Just Down to the Hours Tuesday: We saw the kids for a mere two hours before wishing them a great summer. In that short time, my P.E. buddy and I managed to get censored on the Morning Announcements (I dropped the f-bomb...which would be "fart") and rode a mini-motorcycle through the assembly. In this. 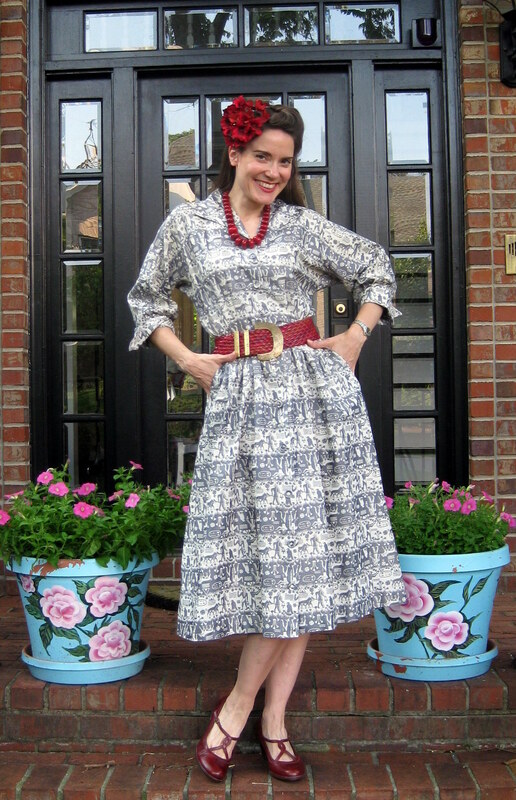 dress: vintage '80's, thrifted; belt: gift from a friend, outfitted with flower by me; shoes: Anthro, can you tell I like them? 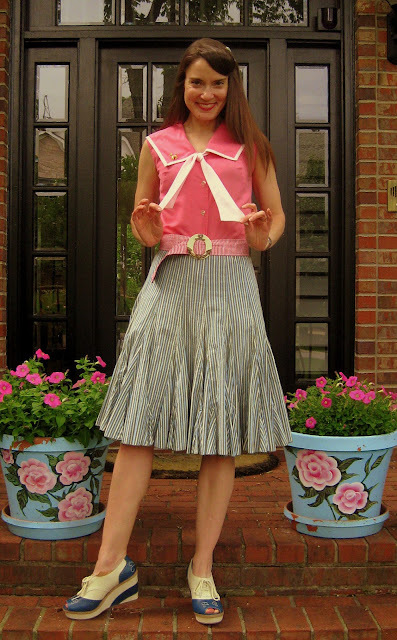 My full skirted dress reminded me of this one found here. I love the horizontal stripes...but I've always been warned to avoid 'em. More pattern-y stuff found here. See, I'm not the only one that likes to hold her skirt out. I swear, I just don't know what to do with my hands! Don't you love this? I found it here. Love the green and red. 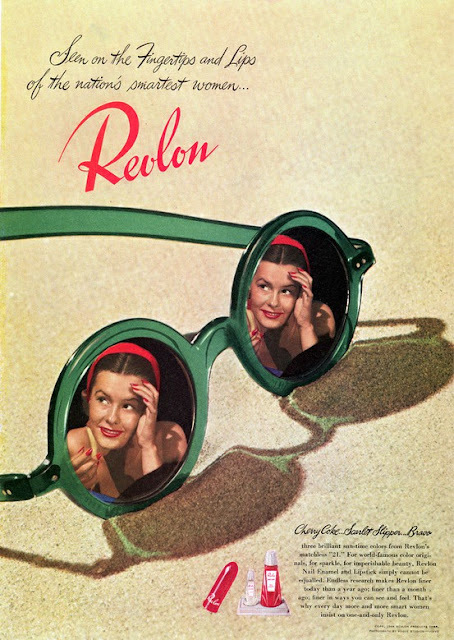 Vintage Revlon ad via pinterest. 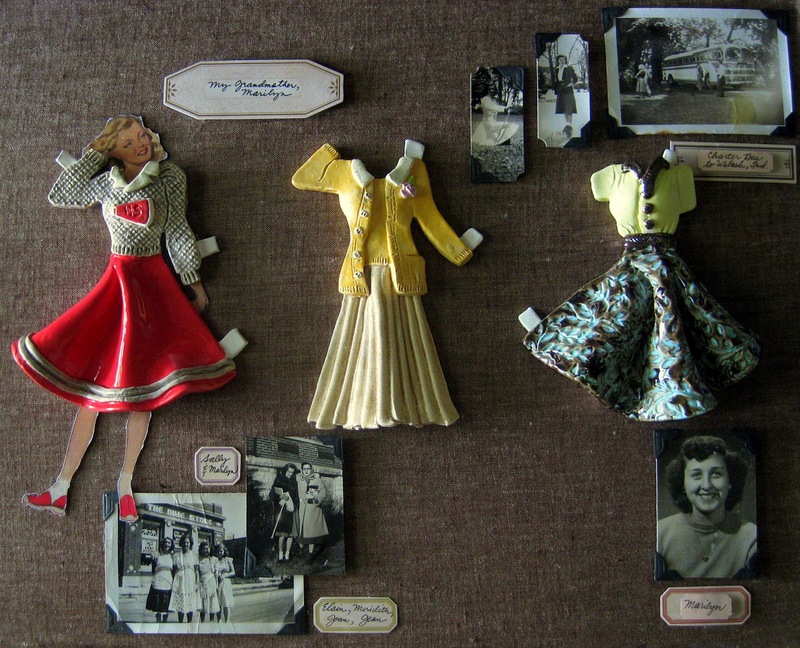 My shadow boxes full of photos of my grandmother Marilyn, her friends and family with the ceramic paper doll dresses I created. Ya'll might remember these ceramic doll dresses I created while back. Looking at old family photos, I based the design of the dresses on clothing that my maternal grandmother wore in the early 1950's. 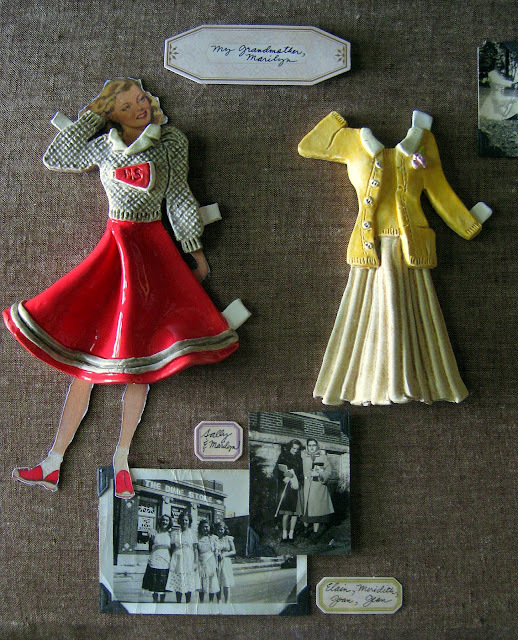 The dresses were modeled on a vintage paper doll from my kinda-too-big collection, and glazed and fired in colors popular during that era. The first shadow box I worked on, without the glass top. The reflection of the glass was a pinch too difficult to deal with when snapping photos. And while I was pretty excited by the result of most of the dresses (I hate that glaze sometimes does the ugly and unexpected), I was then stuck with "okay, now what?" syndrome. I had some thoughts rolling around in my head but each seemed to take away from the idea behind the dresses: my grandmother. 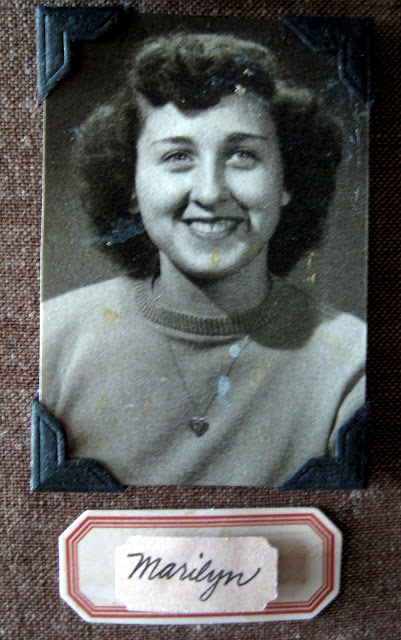 I have a very limited number of photos of my grandma. In family, pictures of her are like gold. She was/is very much loved. 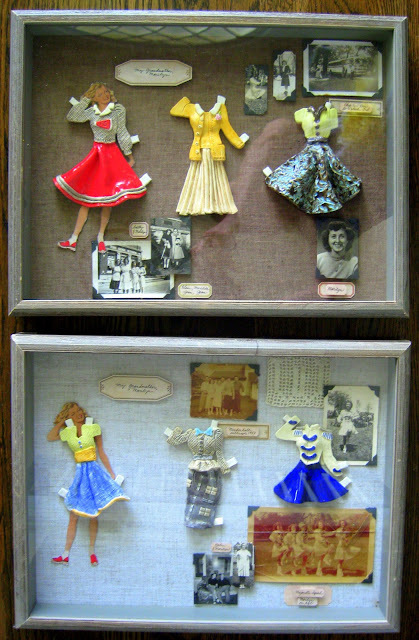 When an art teacher buddy suggested I use shadow boxes, it was like a slap-to-the-forehead-why-didn't-I-think-of-that moment. I rushed out to a craft shop and scooped up these vintage-y looking boxes along with a die cutter that created the labels and a super fine-tipped marker. 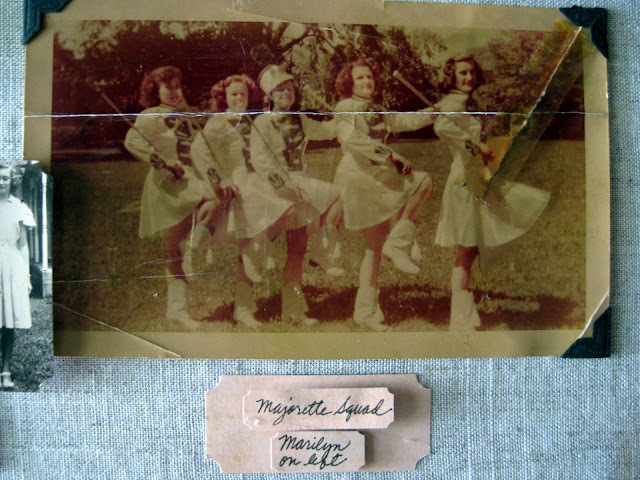 Because my grandmother has since past, taking with her many memories, I had to rely on what was written on the back of the photo for my information. Putting these boxes together proved to be difficult for me as I have just a slight problem with showing restraint (see any outfit post and you'll see what I mean). Working in collage for me is more of a matter of subtraction rather than addition. 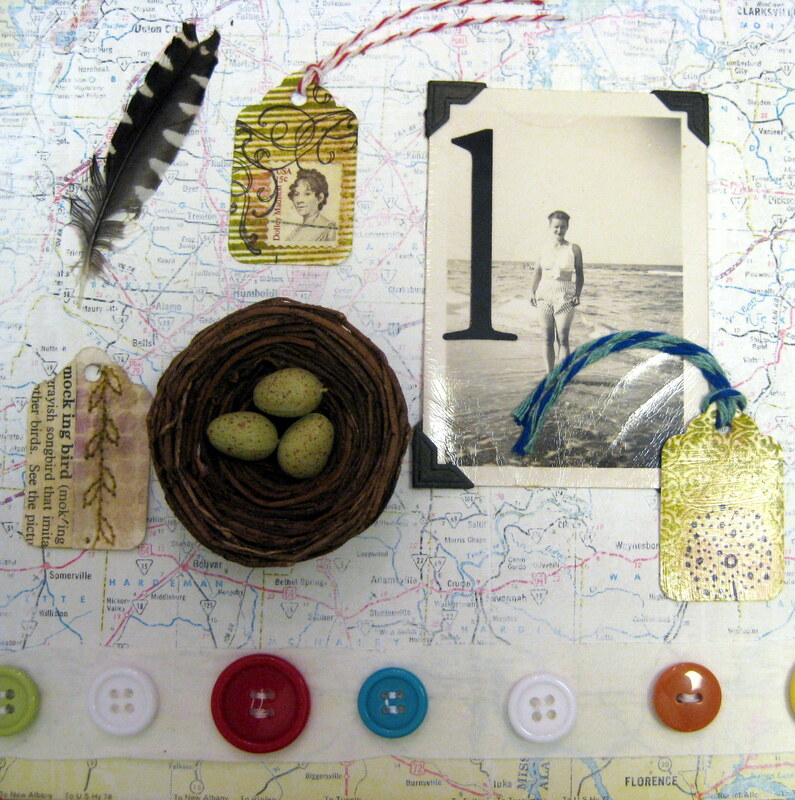 What didn't make the cut: vintage stamps, buttons and an old letter. 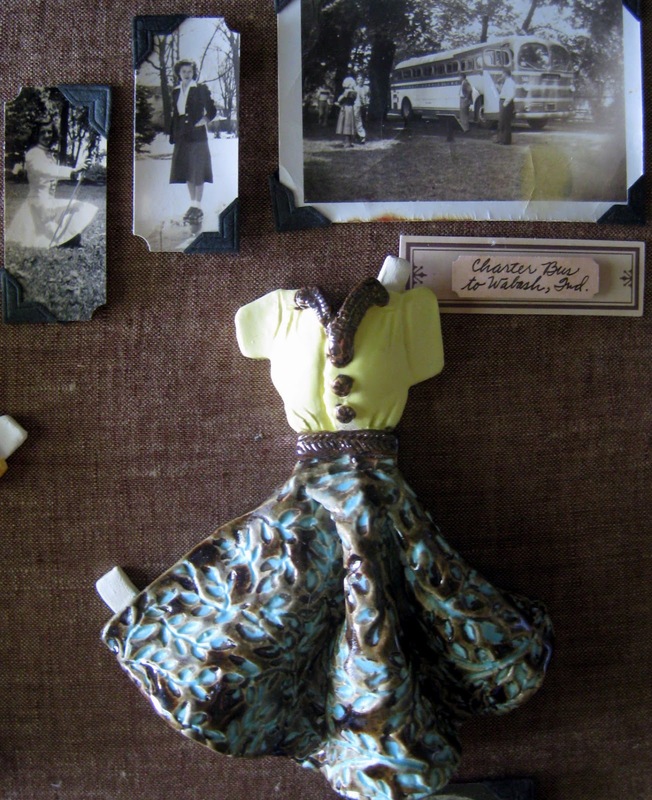 With everything competing for attention, my grandmother and her dresses seemed to get a little lost. I love this buttery yellow glaze. Satin glaze by Duncan is my favorite. So I decided to use vintage variegated linen for the background which I adhered to the masonite board with 3M Spray Adhesive (the best spray adhesive there is). 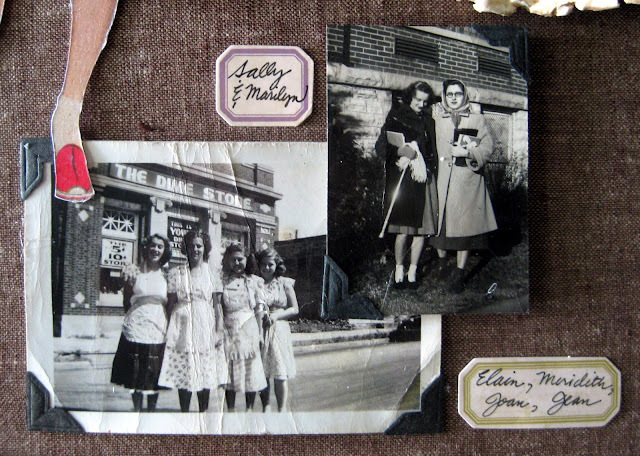 I had some of these vintage photo corners and glued the photos to the background with my hot glue gun. In true can't-leave-well-enough-alone fashion, I immediately added another photo to this box after snapping these picks. I filled that blank area on the bottom left with another photo of my grandma. To add some three-dimensional quality to the photos, I used 3M double sided sticky tape to lift the photos up a bit. It's hard to tell in these photos but in real life, you can see that some photos pop out. My grandma was a majorette. Sadly, I don't have many photos of her in her outfit, but plenty of her friends, as seen above. 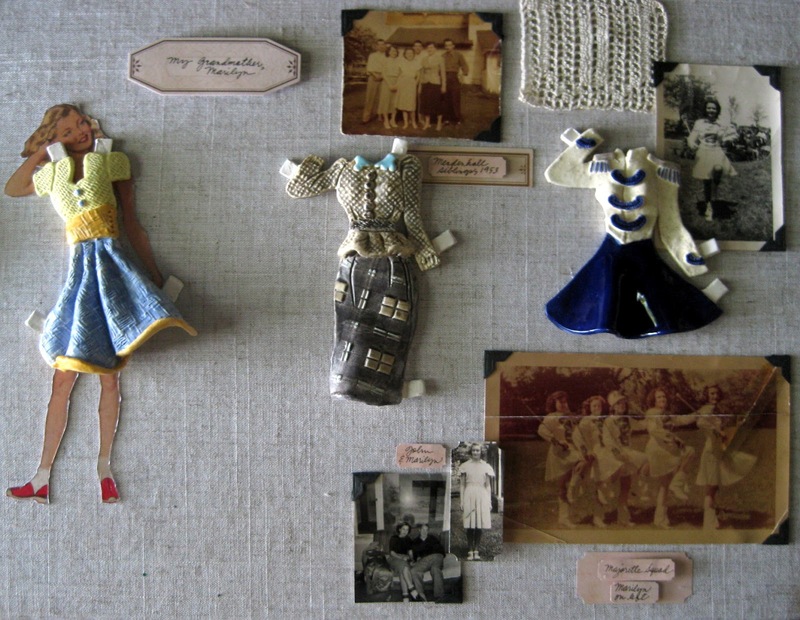 The last thing added to the frame were the dresses. I used that stinky but very sticky E-6000 glue. You might remember that I've actually got more dresses created than just these, like a prom dress and one that looks suited for a debutante's ball, but I thought these worked the best. Love that curly hair and strong calf muscle. And that was it. I'm pretty excited with how they turned out. Right now they are being hung in my school district's central office along with the incredible pieces created by the art teachers that I work with. If I manage to get over there, I'll have to snap a couple photos and share it with you. 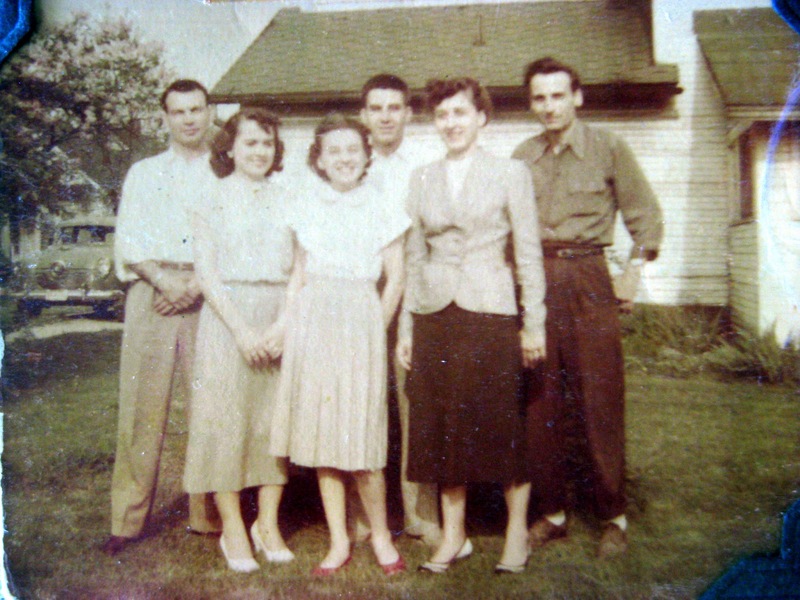 My grandmother with her siblings. My grandma is the one in the suit, second from the right. My mom noticed how my grandmother was standing: no hands on her hips or pose, but arms by her sides and feet planted, looking strong and determined. 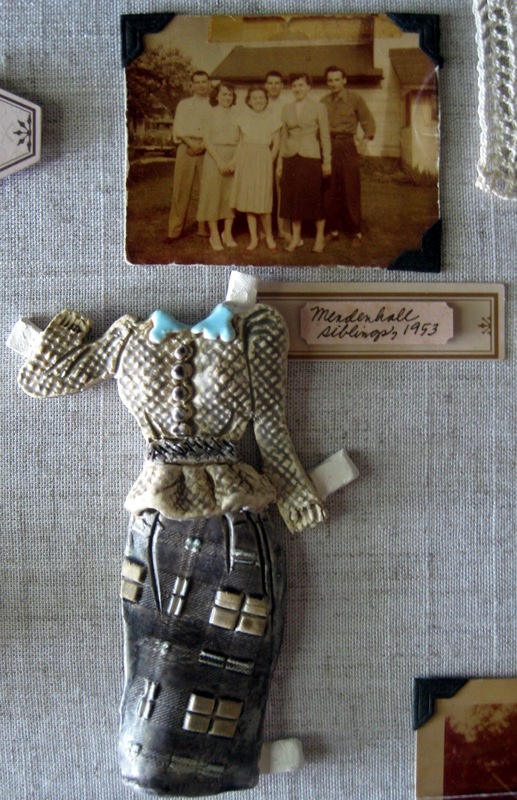 My only regret...not having a paper doll that looked a little more like my grandma. I made color copies of the original paper doll so I would have multiples and not damage the original. My grandma's high school graduation photo. I really can't wait to get them home. I have yet to decide where I'll hang them...maybe in my very crowded sewing room or my rather bare bonus room. Regardless, I know I want to create more dedicated to my grandma and other wonderful women in my life. Thank you so much for your suggestions and encouragement on the first installment of this project. They motivated and inspired me to complete these pieces! I love this sweet interaction between the ladybug and the snail by a second grade artist. A week ago today, I was scrambling to get the last of the clay projects fired and the art room ready for a display of well over 300 clay projects. Now, on this here last day of school (sniff! ), the art room is empty. 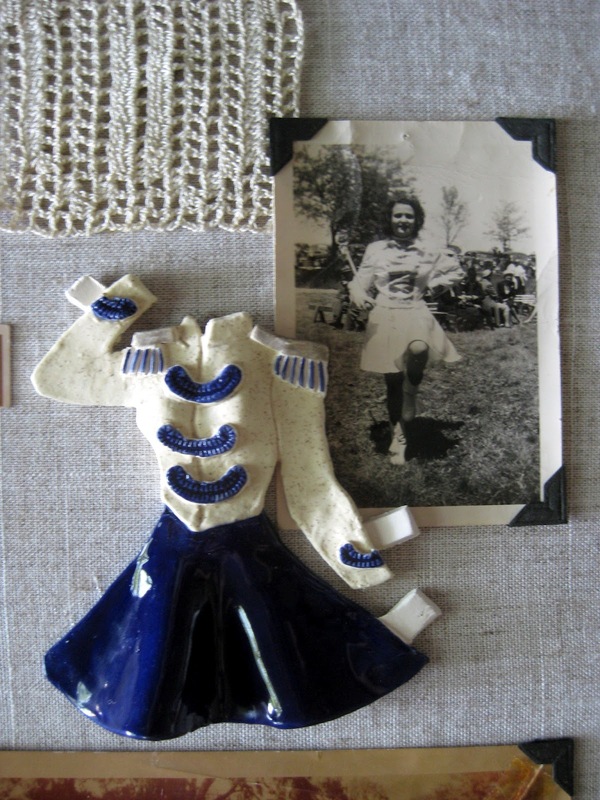 And all of those clay projects are proudly displayed on someone's mantle, nightstand, coffee table or kitchen window sill. Such a happy thought. Thankfully, hubs was on hand during the art show as my photographer. He managed to snap these photos of the clay display in my room. 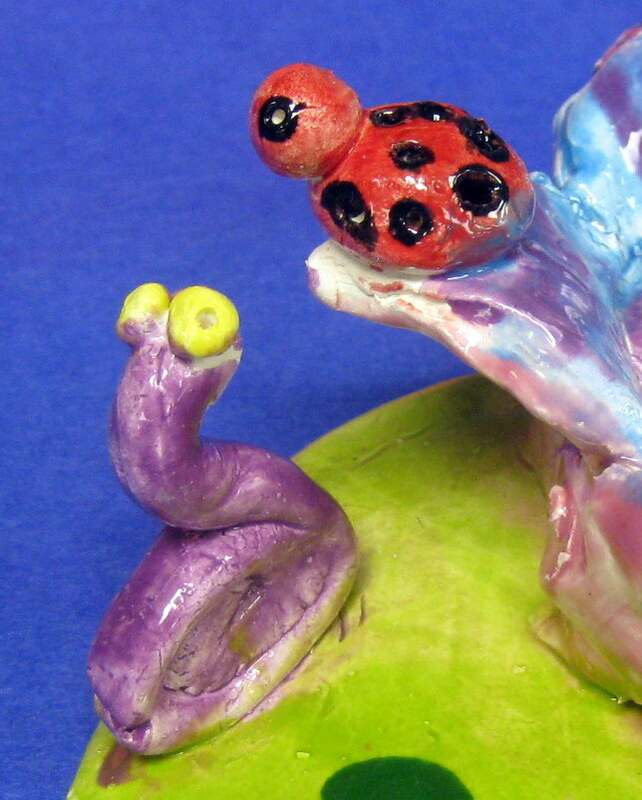 I'm attaching links to my clay lessons, if you are interested. Thank you for sharing this happy art show memory with me! Next up on In the Art Room: the Walk like an Egyptian performance. Last week's In the Art Room: Art Show Part 1 can be found here. The Egyptian entrance to the art room. So glad hubs got a photo of this as it will be coming down soon. Next year's theme is in the works. Entering at their own risk. This is the sight you are greeted with when you enter my room. 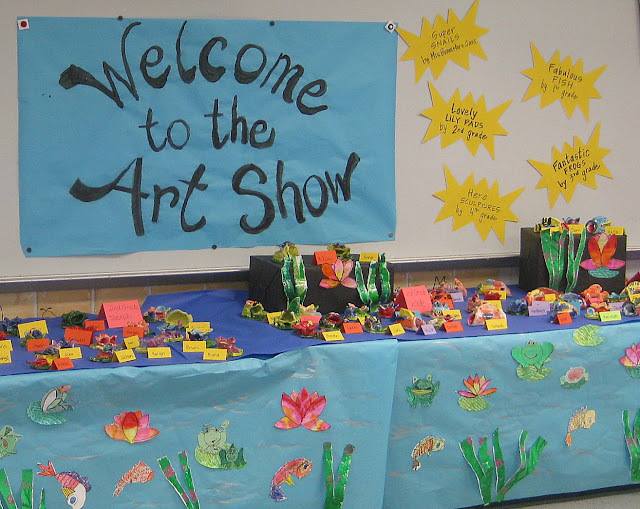 This is usually where my drum set and gong are...but for the sake of my sanity, these things were put away during the art show. Again, this is all going away shortly. I cannot wait to begin work on my new theme. Because all of my first through fourth grade students had ceramics to display (the kindergarten kids clay projects were Butterfly Reliefs that you can see here), I had to make room for well over 300 projects. I used every table I had as well as all of my counter space for display. 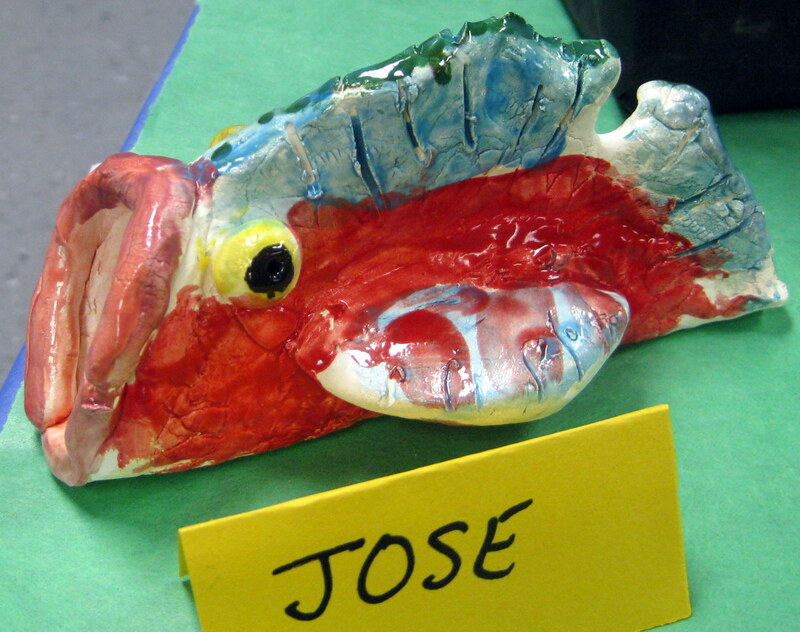 The infamous fish taco clay project. 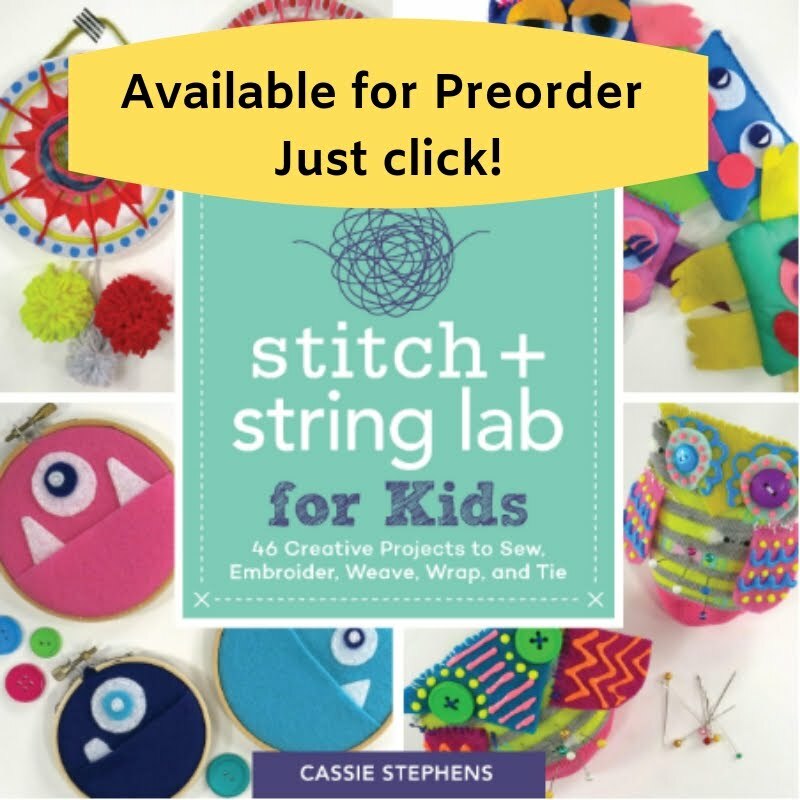 I love this lesson, it's always a hit with the kids. These fish were created by my first grade students. 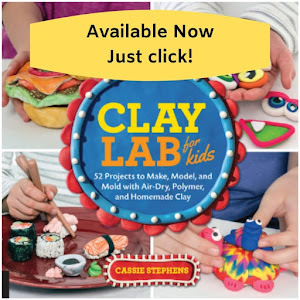 This lesson idea comes courtesy of The Clay Lady. 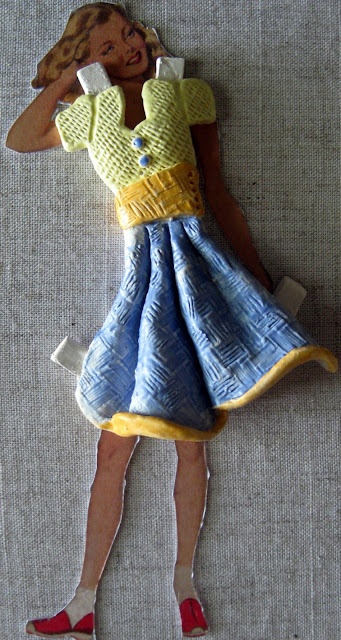 I've altered the directions a bit, so here it is: lay a texture, like lace or burlap, onto your work surface; pound to Oreo thickness and remove from texture; using a skewer, trace a circle template; fold like a taco and pinch closed with the exception of an opening for the mouth; add eyes, fins, lips and viola! You found Nemo! My counter covered in ceramics. 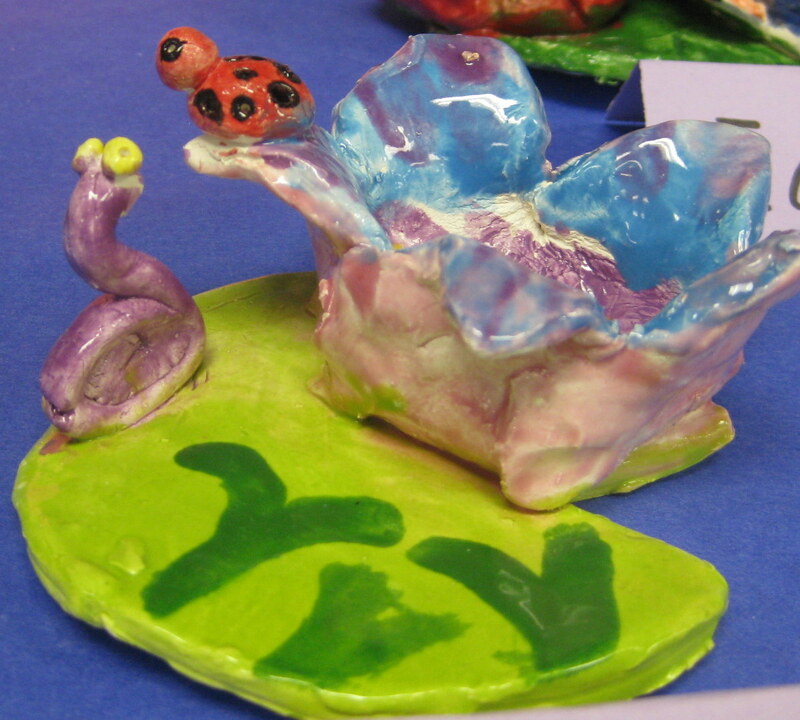 Because the kids have also been learning about the artist Claude Monet and his garden in Giverny, all of our clay projects are pond-themed. 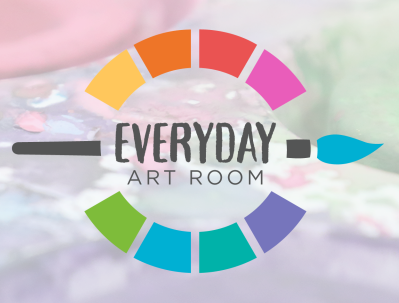 You can see our Mammoth Monet Mural here. 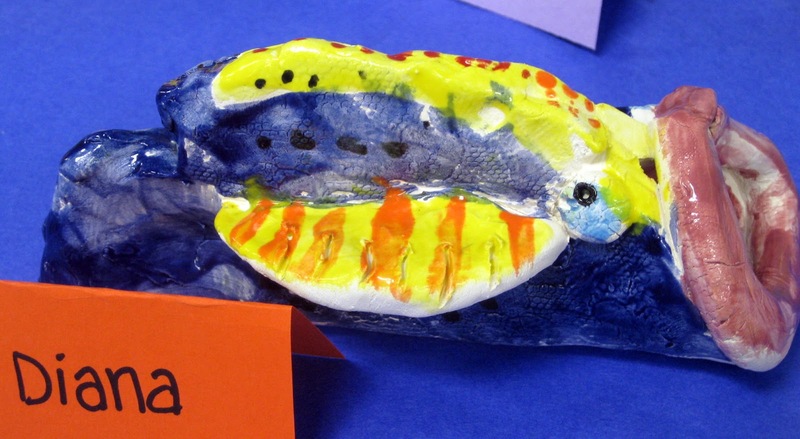 In keeping with that theme, I had the kids create drawings of their clay projects, like fish, lily pads and frogs. 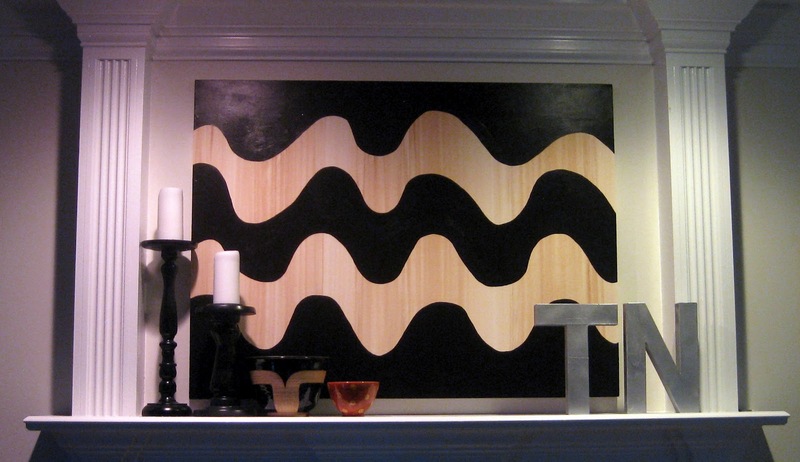 These drawings were then cut out and used as the "table clothes" you see draped over my cabinets and tables. 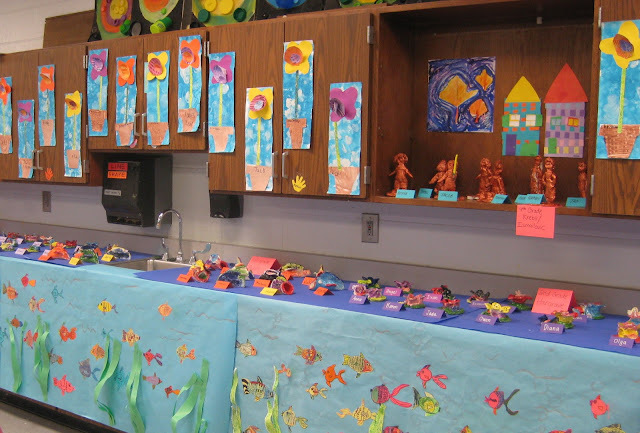 Sweet Monet-inspired lily pads created by my second grade artists. You can find the complete lesson here. 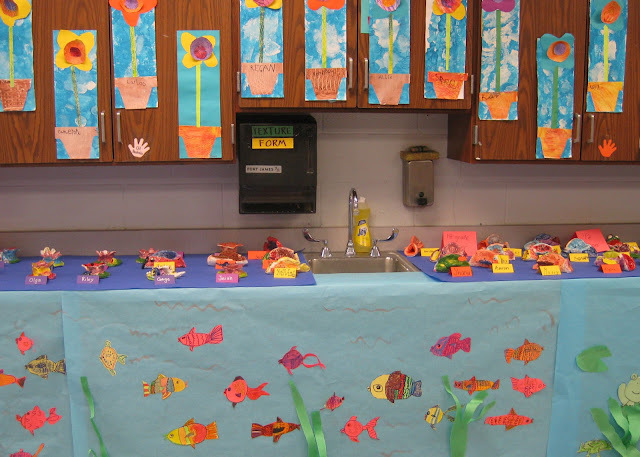 To decorate my word wall cabinets, I hung up these Flower Pot Collages that my wee kindergarten friends had just completed. 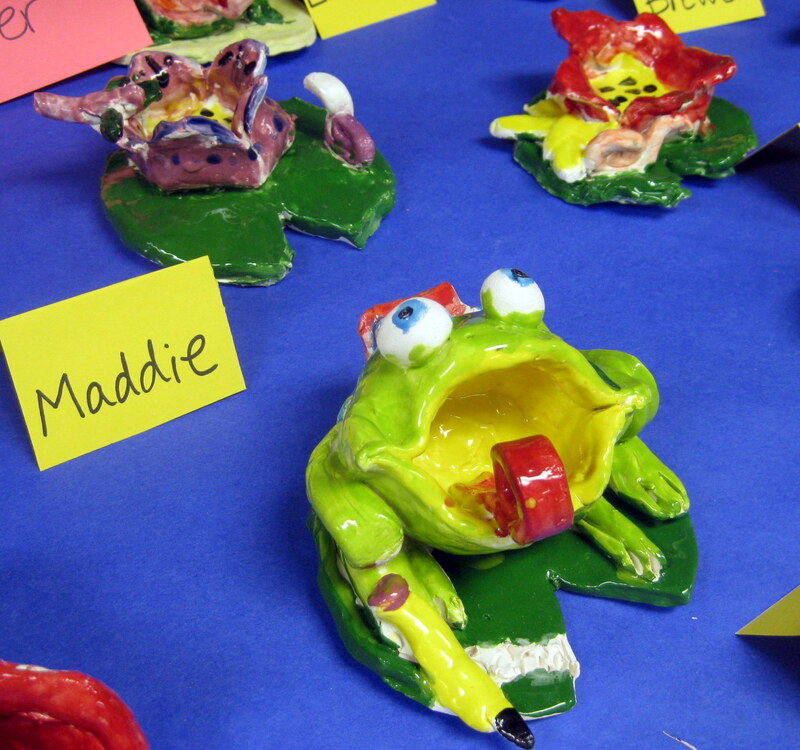 The clay frogs stole the show. 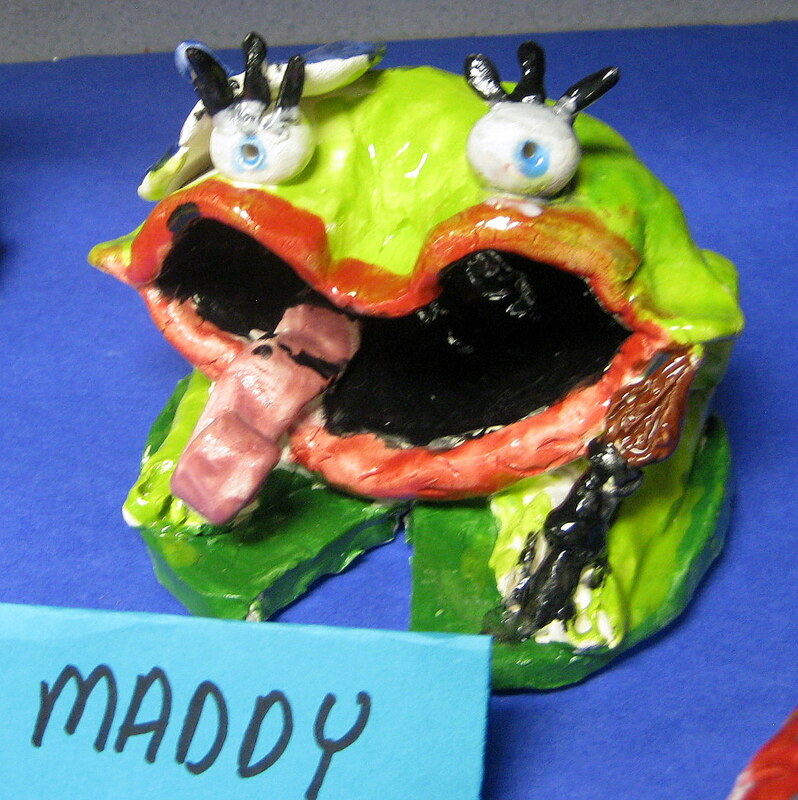 I love big-mouthed and bright-eyed paint-brush-holding frog created by a super sweet third grade artist. Check out the froggy lesson here. To spice up the display a little bit, we mixed the frogs, fish and lily pads up a bit. 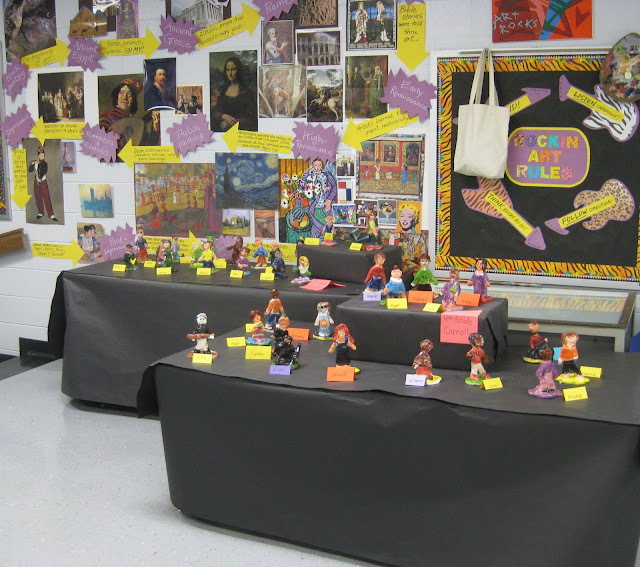 With my former student teacher, the fourth graders created these sculptures of fictional heroes. This was a great lesson she created...the kids were to come up with ideas of what characteristics a hero would have and create a hero based from there. 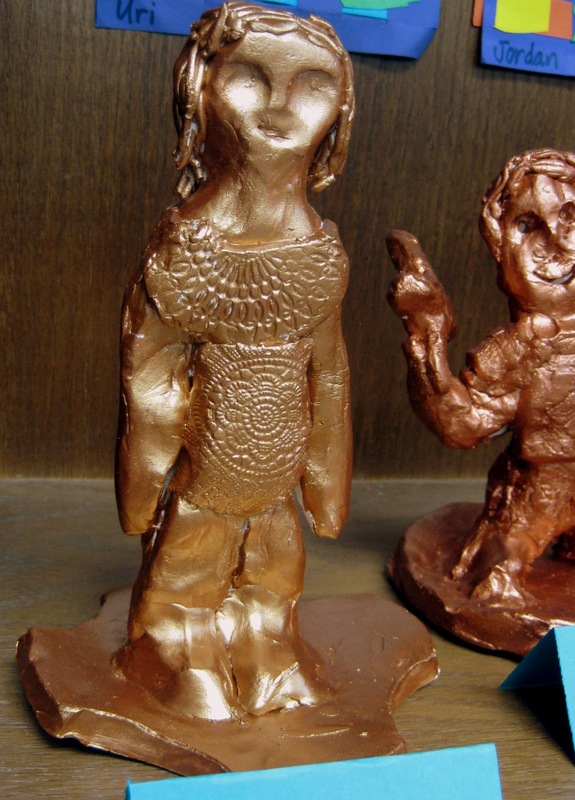 Some of the heroes were glazed while others where painted copper. 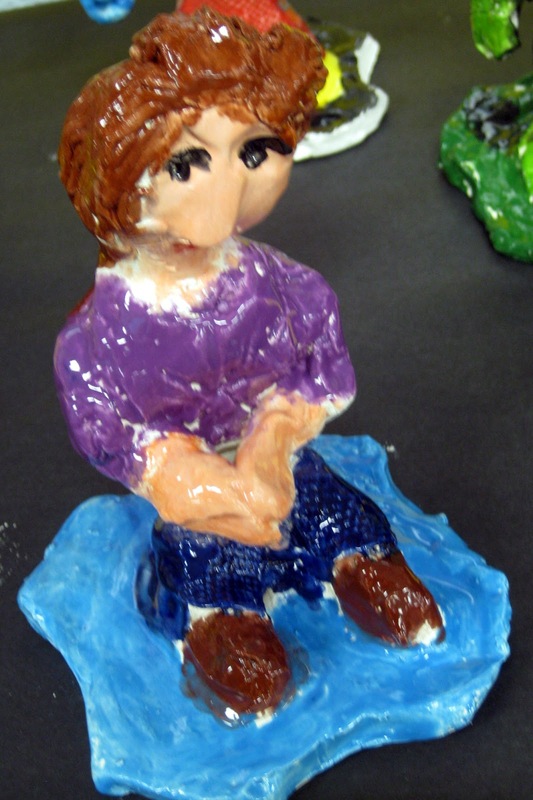 A seated heroine contemplating her awesomeness. At the time, the students were also learning about the Statue of Liberty. Because she is made from copper, some of the students painted their heroes with copper paint. 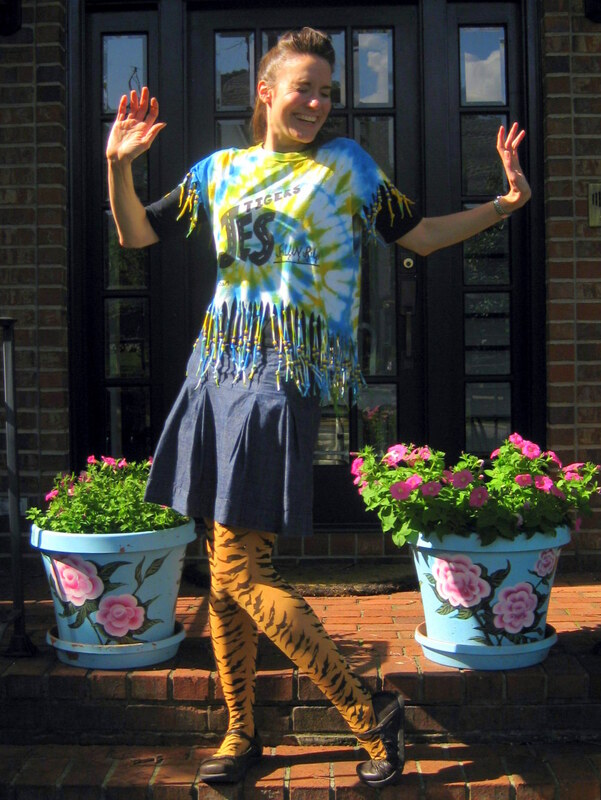 In honor of the school-wide Egyptian-themed art show and the premiere performance of Walk Like an Egyptian by our second grade stars, I decided to go all Ms. Frizzle and the Magic School Bus with my outfits this week. That's right, I'm All-Egyptian, All-the-Time with the exception of Field Day Friday. And in honor of my Egyptian ensembles, I thought I'd share with you some Ancient Egyptian history. When it comes to Egypt, I'm like a regular Encyclopedia Britannica -- and for those of you born after 1995, I'm like a regular google search. Read carefully, there's a quiz later! Love this dress. Picked up from the fab etsy seller Hollie Point Vintage. The color of the print reminded me of Egyptian shabti. These little figures, usually no more than a few inches tall, were believed to spring to life and become servants for their owner in the Afterlife. Hundreds were usually found in the tombs of pharaohs and queens. 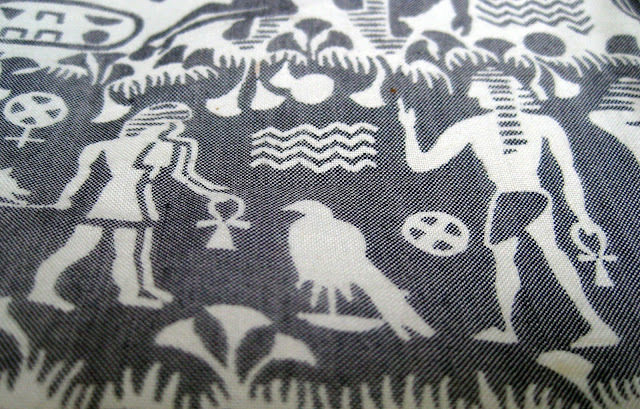 Image found here. 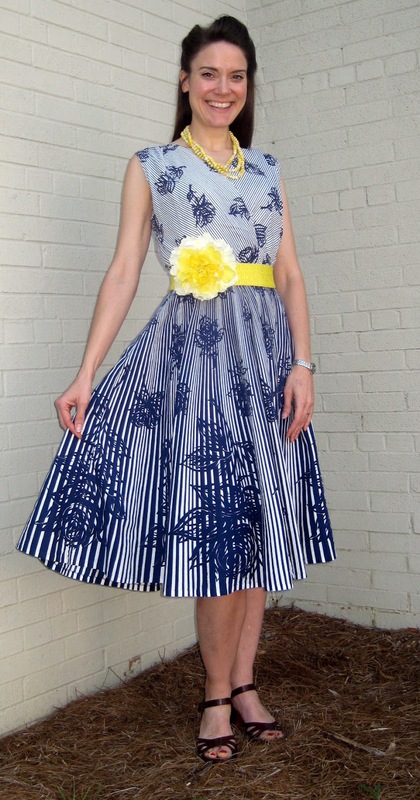 I love this dress and the seller was especially kind and excited to know I'd be wearing it when teaching los kiddos. 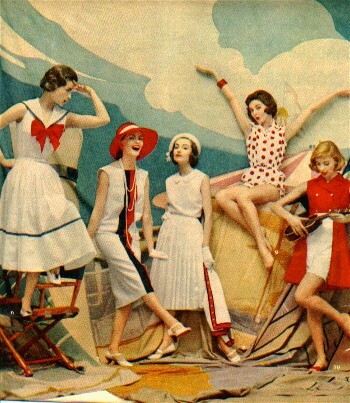 For that reason, you must check out Vintage with Appeal. 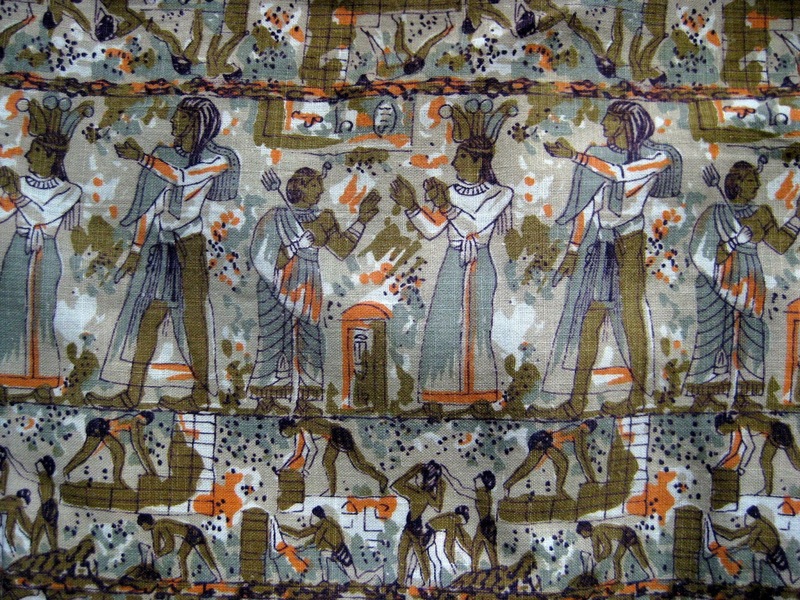 The print on this dress reminded me of images I'd seen of the Egyptian Book of the Dead. This book was placed in the tomb of the deceased. It consisted of spells that were believed to help the dead in their journey through the underworld and to the Afterlife. 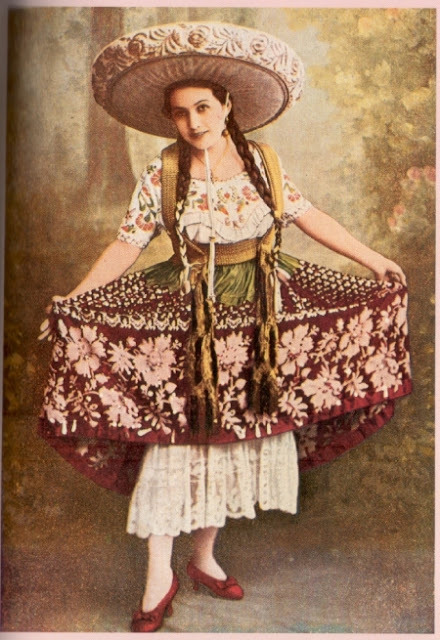 Image found here. So my students all know an adapted version of the Steve Martin classic King Tut. And I'm only mildly offended that they refer to me as "King Nut". 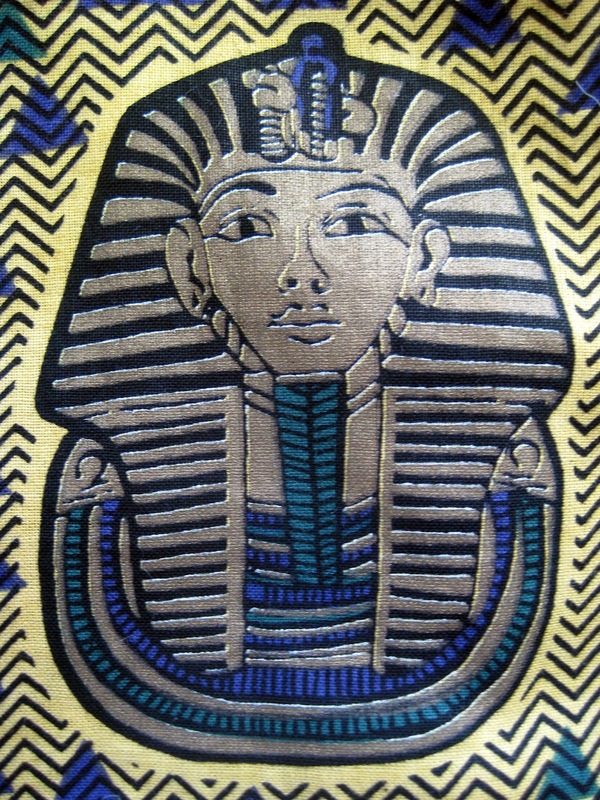 King Tutankhamun was most famous not only because he became king at 9, but also for his mysterious death at age 18. 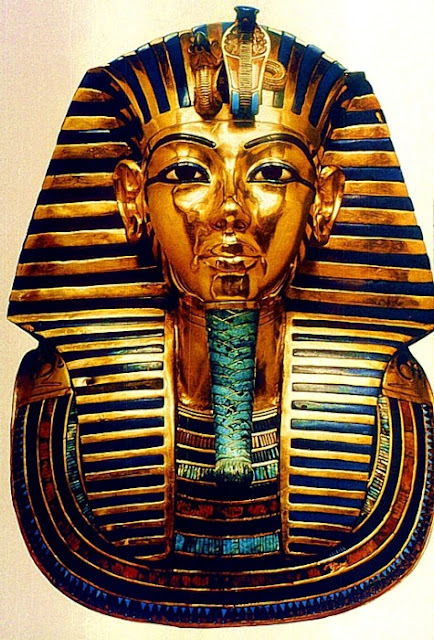 His tomb was found completely intact in 1923 by Howard Carter. The Egyptians believed that those that tampered with tombs would become victims of bad luck. A mysterious number of people died after the unearthing of Tut's tomb. Another fab etsian. 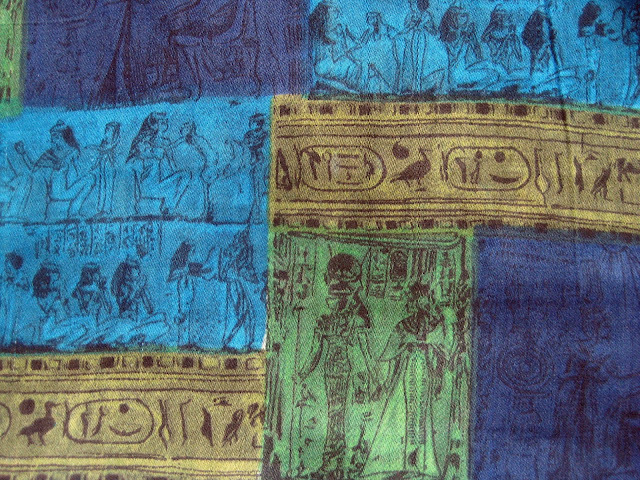 Can you tell I scooped up all of the best Egyptian dresses? I've already started searching etsy for next year's theme! Please visit this lovely shop, the owner of Oh, Dear Things is just the sweetest. The anch is featured all over my dress. 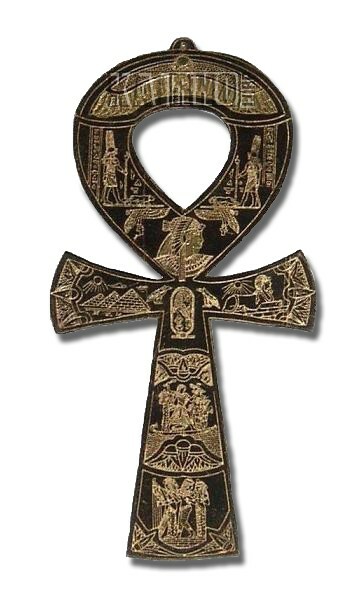 It's the Ancient Egyptian symbol for life. Found here. 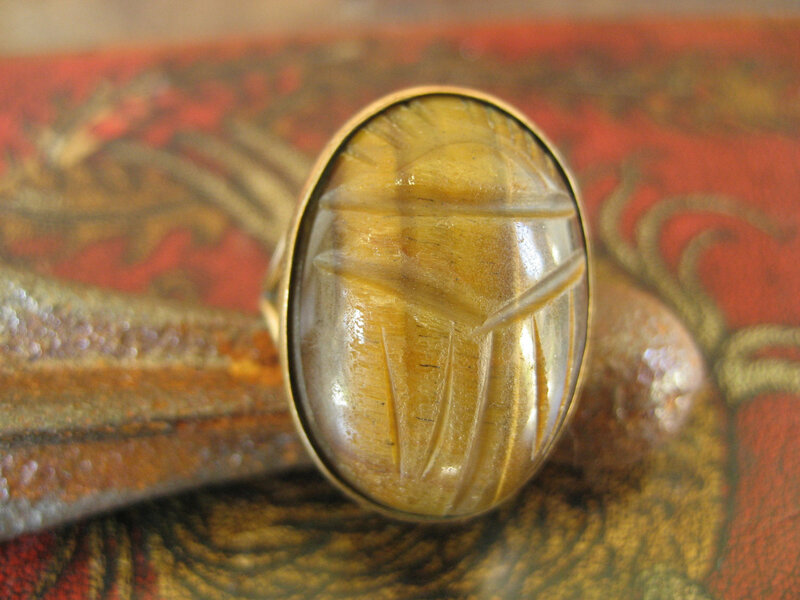 Nothing goes better with tiger-stripe tights than a tiger stone scarab beetle ring. The Egyptians saw the scarab beetle (also known as the dung beetle) rolling balls of dung across the sand. From this they gathered that the beetle was responsible for rolling the sun up and down everyday. In their mind, the scarab beetle was the symbol for rejuvenation. Ring found here.